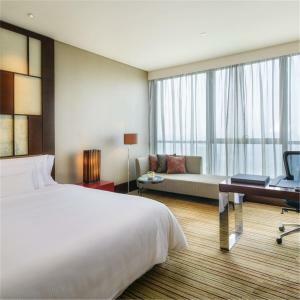 Set in the popular Sanlitun entertainment area, The Westin Beijing Chaoyang offers spacious accommodation with floor-to-ceiling windows. The property boasts an indoor pool, a fully equipped gym and 6 dining choices. 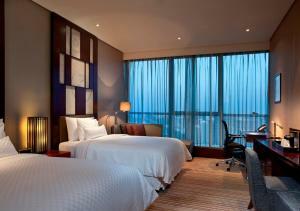 Tastefully decorated, elegant rooms feature modern interiors and soothing colour tones. 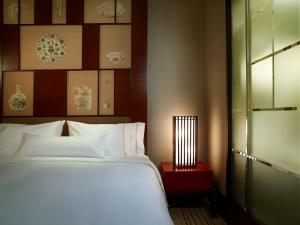 Each is fitted with an interactive flat-screen TV, the signature Heavenly bed and a large work area. A bathtub and separate rainshower is in the attached bathroom. At the iSPA centre, guests can indulge in relaxing body massages, or simply laze in the sauna. Currency exchange and car rental services are provided at the tour desk. Zen5es restaurant serves a variety of Chinese dishes, while steak and seafood is offered at Grange Grill. Other dining options include international fare at Seasonal Tastes and authentic Japanese cuisine at Mai. Beverage, bakery and desserts are offered at Exchange and Daily Treats. The Westin Chaoyang Beijing is a 2-minute walk from Liangmaqiao Subway Station and a 10-minute drive from Beijing Railway Station. 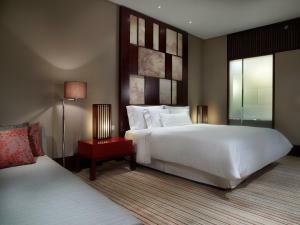 It is a 25-minute drive from Beijing Capital International Airport. Guests are required to show a valid government-issued ID card or passport upon check-in. For Chinese citizens, please note that only residence ID will be accepted as a valid certification upon arrival. Parking is chargeable depending on the types of vehicles and the parking time. Цена: CNY 850.00 ... CNY 2800.00; select dates below to get current rates.